. : Optics & Photonics Focus :: A New Twist to Optical Detectors :. Many are afraid of darkness, but who gets spooked by light? Light has now been used to condition rats to fear, teaching us about fear memory formation. Out-of-equilibrium phenomena can be the source of many a novel discovery. Their very complexity makes them interesting and challenging. The interaction between Brownian motion and optical forces now provides us with new insights into these phenomena. Our eyes perceive our surroundings, convey emotion and, some may say, that they can even speak, loud and clear. Now, with the help of an optical illusion, our eyes can also write. A new arrival in the family of optical detectors gives a new twist to the detection of the orbital angular momentum of light. This could make classical and quantum optical communications even easier. Detecting the twist of light. The orbital angular momentum (OAM) of light can be detected after having been converted into surface waves, known as surface plasmons. This is the principle behind the new detector of OAM proposed by researchers at Harvard University. How many properties of light can you think of off the top of your head? When looking at a light source, we can immediately tell its intensity or its color, but there is so much more to light than meets the eye: other properties, such as its polarization or its twist, have proven useful not only in research labs but also in daily life, simplifying tasks such as optical communications or data storage. These additional properties of light are not always easy to detect, so new methods and techniques are continuously developed to facilitate the task. A new proposal at Harvard University in Boston (Massachusetts, USA) might soon help develop very compact devices to detect the twist of light. What, exactly, is the twist of light? Its technical name is orbital angular momentum (OAM), and it is a quantity that expresses the amount of rotation in the spatial field distribution of light. In practice, like many other natural phenomena, light can be twisted into a whirlpool-like pattern, known as an optical vortex. The photons of a laser beam, for example, normally travel along the direction of propagation with a constant phase, like a squad of soldiers all marching at the same pace. An optical vortex is a beam of light whose phase twists spirally along the direction of propagation of the beam. Because of this corklike movement, the optical vortex looks like a doughnut: a ring of light with a dark hole in its center. "The detection of the angular momentum of light is a very active research area which receives increasing interest, in particular due to its potential applications in classical and quantum optical communications," explains Patrice Genevet from Harvard University. One of the most widely used techniques for the detection of this property of light is based on holography and combines light modulators with CCD cameras or optical fibers. "This system has the advantage of being easy to use in probing different OAM states, but also the disadvantage of not being very efficient: that is, you lose a lot of light," points out Gabriel Molina-Terriza, from Macquarie University (Sidney, Australia). "More recently, a refractive technique was implemented […], which is very promising, because it features a high degree of efficiency, as well as the potential to measure different OAM states at the same time, while needing virtually no alignment. Unfortunately, the crosstalk between modes is at present much higher than with other standard techniques." As an alternative to these methods, the researchers at Harvard University have developed a detector for measuring the angular momentum of light based on surface plasmons, that is, on electromagnetic waves created on the surface of a metal when hit by photons. This is a somewhat similar wave to the ripple that spreads on the surface of a pond when you throw a stone into the water. To fabricate their novel device, the researchers first plate a detector with a thick film of gold, rendering it totally opaque to light. They then etch the gold film with a shallow nanoscale pattern that converts the incident light into surface plasmons and allows them to detect the orbital angular momentum of light. As Genevet explains, "the design of the pattern, performed following the principle of holography, is the key ingredient of the device: it defines which vortex beam can efficiently excite the metal's electrons to produce a focused surface wave. In the detection process, the focused light encounters a series of nano-sized perforations which punch all the way through the gold film, eventually funneling light into the active region of the detector. If you like, the array of holes acts as a spatial filter that collects the focused surface wave, and redirects it into the detector. If the incoming light does not match the holographic pattern, the plasmon beam fails to focus and it is not detected." 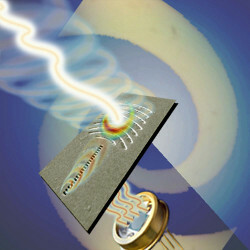 "Compared with more standard techniques, the new proposal seems to have the advantage of being able to integrate the optical and electronic components in a single detector," points out Molina-Terriza. "Typically, in all diffractive techniques you need a certain distance to propagate the optical field before detecting it, while in this case, the use of patterned metallic films directly on top of the detector avoids this step. On the other hand, I see many disadvantages at this stage: mainly, that losses seem to be very high." And Genevet confirms: "Our approach is very simple and it can be integrated in classical detectors. But, as you know, every medal has two sides: we are using surface plasmon polaritons, which are known for being very lossy waves, in particular in the visible and near-IR, limiting the effective size of our couplers and therefore the amount of light funneled through the gold film toward the active region of the detectors. To be viable for real applications, one will have to implement this technique with efficient detectors, such as avalanche photodiodes." "I would like to think that we have made a significant step towards the implementation of plasmonic surface waves into real applications," says Genevet. "We believe that OAM multiplexing is the solution to satisfying the ever-increasing demand for fast information transfer and that our approach can help foster development of optical communications based on it." And Molina-Terriza concludes: "I think that this is a beautiful example of how a clever use of the spatial properties of light and the fabrication of plasmonic structures can give rise to new devices. Hopefully, this will be just a first step in exploring much more interesting phenomena, like for example the sub-wavelength control of the response of the electrons in the detector." GV is currently a CNRS Postdoctoral Researcher at the Institute Langevin, ESPCI, Paris, France. His research focuses on scattering in complex media, nanophotonics, and light-matter interaction on the nanoscale. Patrice Genevet, Jiao Lin, Mikhail A. Kats & Federico Capasso, Holographic detection of the orbital angular momentum of light with plasmonic photodiodes, Nature Communications (2012) 3, 1278 (link).